The World Trade Center Panama Complex is centrally located within the financial district and gives easy access to many local amenities. It’s been built in 1996 with the highest standards of design and construction and is monumental in its structure. It is also one of the few buildings in Panama City that complies with the US Fire Code and provides high security to tenants and visitors. It consists of 2 towers and a commercial area. The primary tower contains 20 floors with 84 Class A Offices and offer to all its users and visitors all the facilities they require in one convenient location in Panamas financial district, where a number of amenities such as restaurants, banks, and commercial plazas can be found. The Commercial Area connects the Office Tower with the Hotel and Casino. It is a three story area featuring Regus, restaurants, clothing store, full service bank branch & other amenities and offers over 10 thousand square meters (almost 110.000 square feet) of commercial and retail space in its podium. The World Trade Center Panama has been able to attract a mix of high profile tenants, smaller independent retail, and food and beverage operations. The Mercure Hotel which contains the Grand Casino Marbella is part of the World Trade Center Panama Complex. With over 112 luxurious and modern rooms they offer 16 exclusive suites with a comfortable working area, a wide range of hosting solutions, events, services and unique benefits. The Hotel has spaces for business meetings, conferences and seminars, social space, as well as space for diplomatic and WTC Panama services functions and they offer a spa club and a swimming pool. WTC Panama Complex is a business center and open 24 hours, which means that security is an important element. The Complex is one of the few buildings within Panama City that complies with the US Fire Code and provides high security to tenants and visitors. The Complex is considered to be one of the well-constructed buildings in Panama and contributes to the image of Panama City as a trade hub and regional financial center. Welcome to the public directory of members of the World Trade Center Panama. WTC Panama Members represent some of the region’s most active international traders, national and international businesses, such as banks, consulates and embassies, legal services, real estate firms, associations and communities, computer and software groups and consulting firms – from billion dollar operations to family-owned, small businesses. Big Bear Security Division Corp.
Continental Investment & Trading, S.A.
PANAMA GREAT ESTATES INTERNATIONAL INC.
SHANGHAI ELECTRIC POWER CONSTRUCTION PANAMA, S.A.
World Trade Center Panama interconnects with its Members and keeps them informed on the latest updates on upcoming and past events by their monthly newsletter. Through this medium they share useful information and showcase the ongoing activities in and around the WTC Panama Complex as well as inform them about the international relationship of WTC Panama with other WTC’s through the WTC Association. During the General Assembly of the WTC Panama , new officers haven been chosen for the Board of Directors. Mrs. Donna Siebrasse of Sanchiz, Siebrasse & Asociados SA, was elected as the new President of the Board of Directors of the WTC Panama organization. Mr. Julio Jolly, Managing Partner Global Partner Advisory director was also elected as a new Member of the Board of Directors of the WTC Panama Complex. Mr. Remy Swaab, Executive Director of the World Trade Center Panama and Mr. Néstor Altuve, General Manager of the leading financial and business weekly publication, “Capital Financiero”, signed a Strategic Alliance to foster synergies between these two well-known cornerstones in the business market, promoting national and international business using their respective platforms, reach and competitive advantages in local and international marketplaces. World Trade Center Panama and World Trade Center Trieste have signed a Memorandum of Understanding where they recognized the mutual benefits to be derived from the support of reciprocal investment and trade opportunities exchange. This agreement was signed by Mr. Remy Swaab, Executive Director WTC Panama and Mr. Enrico Samer, President of WTC Trieste during the General Assembly in Manila, Philippines. Bannockburn Global Forex services will prove very useful to local companies in Panama who regularly deal in foreign exchange and have to handle payables, receivables in foreign exchange or other hedging products. ” In addition to the secure and cost effective foreign exchange transaction it provides, acquiring its services does not require change to the current banking account structure that a company already has in place” mentions Executive Director of WTC Panama, Mr. Remy Swaab. Mr. Rolf Draak, interim CEO of the World Trade Centers Association explains the advantages of this worldwide network of 320 World Trade Centers in 100 countries. All WTC’s are connected through a global network that fosters the development of an international and local business community. Mr. Draak also speaks about the progress and development of this important network in Latin America. At the 46th General Assembly of the WTCA the new WTCA Board of Directors was announced. Mr. Remy Swaab, executive director of WTC Panama was elected to represent the Latin American region. This is the second time WTC Panama has a seat on the board, previously held by Mr. Guillermo Ronderos from 2010 – 2015. 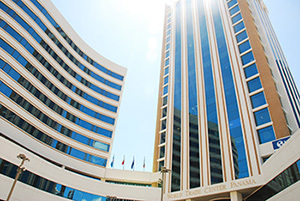 The main business services solutions are offered by the Hotel who can offer reasonable rates thanks to a strategic alliance with World Trade Center Panama, including temporary office space and virtual office solutions, secretarial services and other options that will fit corporate requests and business travels needs. The New Club Facility of World Trade Center Panama situated and offered by the Hotel will provide the Tenants and Members with a conducive networking environment within a beautiful and relaxed setting. Tenants and Members can enjoy premium services as well as benefits and privileges via a passport to more than 300 associated World Trade Clubs around the globe. Exhibition space and services are also included in the portfolio of offerings of the Hotel and through a partnership with Atlapa Convention Center, World Trade Center Panama will be able to help with exhibitions, such as trade fairs, conventions and industry market exhibitions. World Trade Center Panama can offer inbound and outbound Trade Missions Services, professionally managed by the WTC Panama and some of their local partners to find the best prospects and contacts for businesses and the WTC affiliates and clients that might be interested in exploring the Panamanian market. WTC Panama can work on specialized or multi-sector trade missions for groups, offering the WTC Hotel. 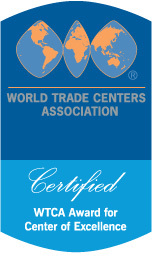 World Trade Center Panama can give access to qualified information, recent statistics and official trade leads approved by its partners in Panama. They can help with global connections through the World Trade Centers Association network with more than 300 WTC’s located in main cities around the world. WTC Panama will share the best Panama has to offer for an effective first. The World Trade Center Panama Administration is committed to providing a high level of Tenant satisfaction and is dedicated to the Tenant requests. WTC Panama is also building a new Administrative Database where direct contact with their Tenants will be possible for all service requests. It offers an ideal place for Tenants to place a service request and register comments and suggestions. Besides this, WTC Panama Maintenance and Security teams are experienced in giving assistance in situations requiring direct action. Scoring amongst the highest in safety of the local buildings, the WTC Panama Complex continuously upholds its high standards by organizing a yearly live fire drill requiring the complete evacuation of the complex under the supervision of the Fire Department of Panama. Open spaces with modular floor offices are available for long and short term tenancy. Short term offices are fully furnished and equipped office facilities are also available. The office space is on the first floor of the World Trade Center Panama Complex. It shares the building with many major financial and professional services businesses, and has access to a wealth of additional business, hospitality and leisure facilities offered by the WTC Panama.